These were issued after the First World War to the next of kin of all British and Empire Service Personnel who were killed as a result of the Great War. 5" Diameter Plaques (Officially called Plaquettes) were made of bronze. But to the general public each one issued was known as a "Dead Man's Penny", being in appearance to the smaller coin in circulation at that time the old Penny. (12 old pennies = 1 shilling). 1,355,000 plaques were issued, cast from 450 Tonnes of Bronze. Issuing the plaques continued after the war, into the 1930's to commemorate people who had died as a consequence of the Great War. Its design and size was decided after a public competition was held. 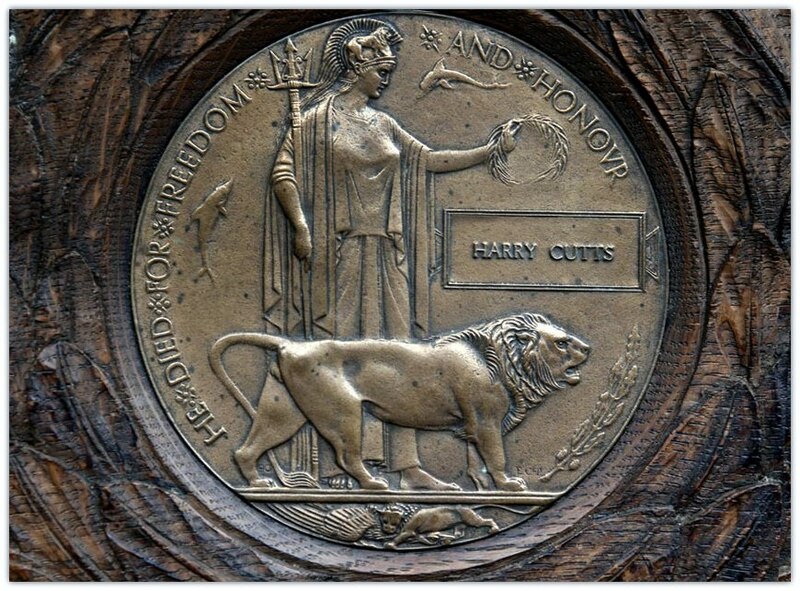 800 designs were submitted, and the winning entry was won by the sculptor and medallist Edward Carter Preston. Submitting his design called "Pyramus" (a character in Greek mythology). Preston received the prize of £250 for his winning design. 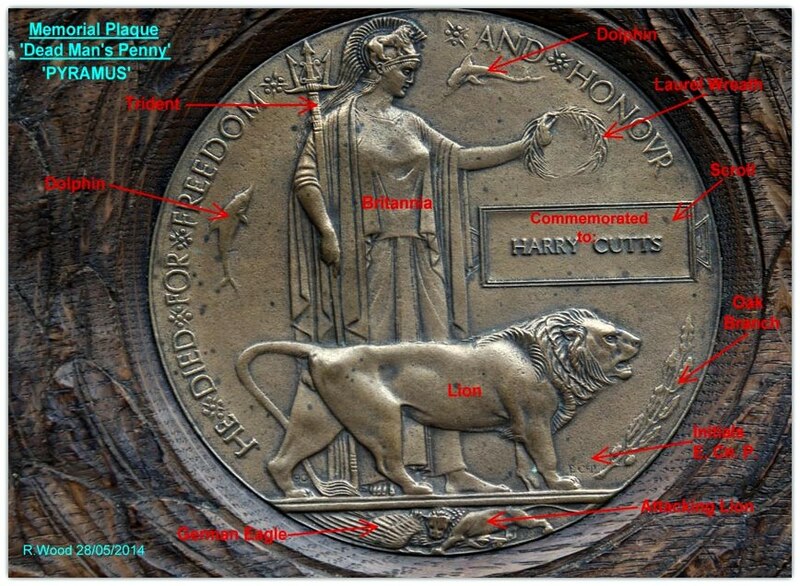 On the obverse side (front) his design shows Britannia standing, supporting a trident under her right arm and clasping it in her right hand. Her left arm is shown outstretched, holding an oak wreath in her hand. Standing in front of Britannia is a roaring lion staring at a branch of a British Oak. The designers initials E. CR. P. appear above the lion's front paws. Above the lions head a rectangular tablet representing a scroll onto which the deceased name was placed in raised letters. Two dolphins swim with Britannia, symbolising Britain as a great sea-faring nation. Below the standing lion, a second lion from the pride is seen, devouring its prey, the German Eagle. The reverse side (back) was left totally blank allowing the plaque to be placed in a picture frame or placed on a stand. 600 Plaquettes were issued to commemorate women who had sacrificed their lives. These were produced adding an 'S' to make 'SHE' rather 'HE'. The plaques were usually issued in a pack which contained a commutative scroll from King George V.
Several of these plaques can now be found for sale, due mainly to the named person having no known relatives.